Poor nutrition is the result of consuming too little, too much, or the wrong kinds of food, on a regular basis. Food science, a root cause of poor nutrition, transforms natural whole foods into garbage that fills the belly while developing excessive human appetites for fat, sugar, and salt. Avoiding poor nutrition simply means refusing to eat junk food. Good nutrition from eating a healthy diet is the foundation of the biopsychosocial model of natural health. Any change in your diet, however small, that improves your natural health is a step in the right direction. A balanced diet includes each food group in the correct proportion. You improve your nutrition and natural health by choosing to eat healthier foods than you are currently eating. This Web page answers the question: "What is a Balanced Diet?" Good nutrition from eating a healthy diet is the foundation of any wellness program. The Goal is to eat healthy foods with a good balance of nutrients at a total caloric rate that will either maintain your present body weight, or achieve your ideal body weight over a reasonably long period of time. Nutrition is the relationship of foods to the health of the human body. The foods we consume should provide our bodies with the nutrients necessary for good health. The basic premise of any good diet is variety, balance and moderation in what we eat, on a regular basis. Good nutrition is obtainable without engaging in dieting extremes. The Ideal Diet is for, so-called, NORMAL individuals who weigh 200 pounds or less and who are SATURATED FAT sensitive individuals. These individuals are susceptible to the adverse effects of Saturated Fat on their blood cholesterol levels. The majority of the population is SATURATED FAT sensitive. The Modified Diet is for, so-called, SUGAR sensitive individuals. These individuals generally weigh more than 200 pounds. They are more susceptible to the adverse effects of dietary sugars than the population of normal body weight is. Persons with known coronary-artery disease, high triglycerides blood levels, diabetics, extremely obese individuals, and those with Syndrome-X are likely to be sensitive to sugars in the diet. Everybody responds to sugar in their diet. Sugar Sensitive individuals exhibit an extreme response to all forms of Sugars. This extreme response is generally considered an ABNORMALITY. In the Ideal Diet, dairy consumption should be eaten sparingly, if at all. This diet, thus, requires that nutritional supplements be taken to prevent osteoporosis. It is an integral part of the Natural Health Perspective natural cures for individuals interested in good natural health to take key nutritional supplements to guarantee that they are getting minimum amounts of critical nutrients. From the Natural Health Perspective what is imporatnt, is good natural health, not being 100% natural. In the Modified Diet, moderate consumption of dairy foods is recommended. Increased dairy consumption has a strong inverse association with insulin resistance syndrome among overweight adults and may reduce risk of type 2 diabetes and cardiovascular disease. In the Ideal Diet, you should be eating equal amounts of whole grains and vegetables. Since processed foods are likely to be made using Grains as a filler, you have to monitor your intake of Grains in order to make sure that you are NOT consuming an excessive amount. This is done by physically throwing away a portion of the rice / pasta / bread (i.e., Grains) and adding one or more vegetables. You, also, need to make sure that you are NOT eating an excessive amount of whole grain bread. In the Modified Diet, You should be eating twice as many vegetables, as whole grains. You should avoid ALL sources of highly refined grains, such as pasta made with white flour. You should eat absolutely NO candy, cakes, or any kind of pastry. Since processed foods are likely to be made using Grains as a filler, you have to monitor your intake of Grains in order to make sure that you are NOT consuming an excessive amount. This is done by physically throwing away a portion of the rice / pasta / bread (i.e., Grains) and adding one or more vegetables. You, also, need to make sure that you are NOT eating an excessive amount of whole grain bread. Whole-grain consumption improves insulin sensitivity in overweight and obese adults. Under the Health principle of Moderation, there is positively a limit to the amount of Carbohydrates that is acceptable in a Healthy diet. The maximum amount allowed in the Ideal Diet is 55%, but ONLY 45% in the Modified Diet. Avoid drinking ALL fruit juices. This translates into eating a whole lot of vegetables. But this time, with a fair amount of lean red meat and poultry, along with a still reasonable amount of the correct kinds of Fat in your diet from fish and olive oil sources in the Modified Diet. Fat is NOT a dirty word. The Natural Health Perspective Diet is NOT a ZERO Fat Diet, an EXTREMELY Low Fat Diet, or even a VERY Low Fat Diet. Under the Health principle of Moderation, too little fat in the diet is considered as bad as too much fat, and can result in Low HDL Levels and an increased risk of mood disorders, depression, stroke, and violence. 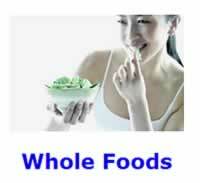 The Natural Health Perspective diet happens to be a LOW Fat Diet . In other words, you should be sure to include a reasonable amount of the correct kinds of Fat in your diet from fish, olive oil, and nut food sources. You should be consuming between two and three times as much Monounsaturated Fat as Saturated. Olive oil, Nuts, and Avocados are all excellent sources of Monounsaturated Fat. "The [Seven Countries] study was the first to demonstrate in population correlations a strong inverse relationship of monounsaturated fatty acids in the diet to coronary, cancer and all-cause mortality." "The Seven Countries Study reported that men in rural Crete in 1960 were apparently safely consuming 40 percent of their energy (calories) in the form of fat, following this pattern: 29 percent monounsaturated fat, 8 percent saturated fat, and 3 percent polyunsaturated fat." This translates to 6% SFA, 21.7% MUFA, 2.3% PUFA for a 30% Fat Diet. Hence, both the Ideal and Modified Diets allow more SFA and PUFA in the diet. In general, there is a tendency in terms of dietary advice towards lowering fat in takes in order to reduce the risk of obesity. However, lowering fat in your diet will increase your blood triglycerides. Thus, the Ideal Diet of 30% Fat and the Modified Diet of 35% fat is a compromised between keeping your triglycerides low, your overall health benefits high, and losing weight. The Natural Health Perspective Diet happens to be a Moderately High-Carbohydrate Diet. Moderately high-carbohydrate diets (45-55% of the daily calories) offer the best mix of health benefits. NOT the Bad kind of Carbohydrates, just the good kind. 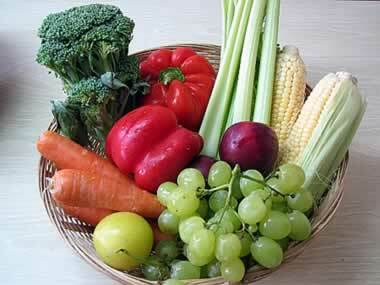 Vegetables are mostly composed of carbohydrates (and a small amount of protein). Vegetables have a high nutrient density. They also contain lots of fiber. A high fiber diet happens to be required for the human body to function properly. Most people eat meat as their major source of protein. Too much meat in the diet, and accordingly too little vegetables, will result in constipation, hemorrhoids, and / or hard stools; due to the lack of fiber in meat products. Hence, there is a limit to the amount of protein that you should consume in the form of meat. "Moderately high-carbohydrate (45-55% of the daily calories)/low-fat diets seem to be a good choice with regard to the prevention of diabetes and cardiovascular risk factors as far as the carbohydrates are rich in fibers. ... Moderately high carbohydrate/low fat diets are most likely to prevent obesity and type 2 diabetes." Grimm JJ. Interaction of physical activity and diet: implications for insulin-glucose dynamics. Public Health Nutr 1999 Sep;2(3A):363-8. PMID: 10610074. "It shows that a high-monounsaturated-fat diet significantly improves insulin sensitivity compared to a high-saturated-fat diet. However, this beneficial effect of monounsaturated fat disappears when total fat intake exceeds 38% of total energy. ... Dietary carbohydrate increases blood glucose levels, particularly in the postprandial period, and consequently also insulin levels and plasma triglycerides. The detrimental effects of a high-carbohydrate diet on plasma glucose/insulin, triglyceride/HDL or fibrinolysis occur only when carbohydrate foods with a high glycaemic index are consumed, while they are abolished if the diet is based largely on fiber-rich, low-glycaemic-index foods." The Natural Health Perspective&trade; Health Program Principle 2: The Fundamental Principle of natural health and fitness is Moderation and Balance in all things.